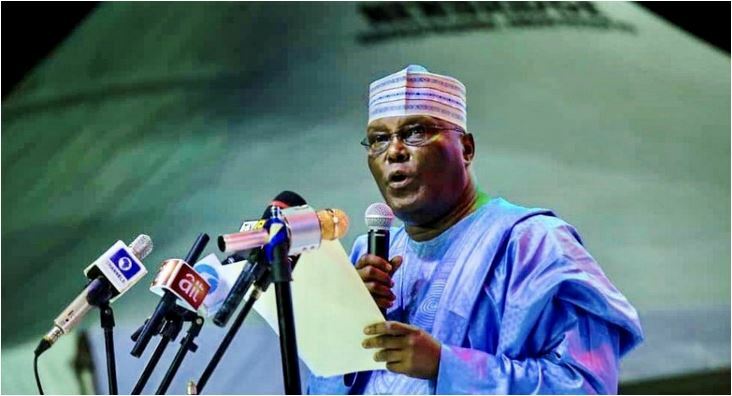 A former Vice-President, Atiku Abubakar, has emerged the Peoples Democratic Party presidential candidate for the 2019 election. He emerged after a keenly contested primary held at Adokiye Amesiamaka Stadium, Port Harcourt, the Rivers State capital, on Sunday. The Chairman of the PDP Convention Committee and Governor of Delta State, Ifeanyi Okowa, announced the results of the primary on Sunday morning. He said Atiku polled 1,532 votes while Aminu Tambuwal polled 693 votes to place second. Other results are, Bukola Saraki , 317 votes; Jonah Jang, 19 votes; Datti Ahmed, 5 votes; David Mark , 35 votes; Tanimu Turaki, 65 votes; Sule Lamido, 96 votes; Attahiru Bafarawa, 48 votes; Ibrahim Dankwambo, 111 votes; Ahmed Makarfi, 74 votes and Rabiu Kwankwaso, 158 votes.